Goal setting is used to direct rehabilitation interventions towards a specific outcome or outcomes. Shared goal setting can also co-ordinate members of the multidisciplinary team and ensure they are working together towards a common goal and that nothing important is missed. Goals can also be used to evaluate the success of rehabilitation interventions. There is no consensus on a gold standard for a method of goal setting, but it is widely held that it is a priority for guiding rehabilitation interventions toward achievable and meaningful outcomes. There is a growing body of literature dedicated to the methods of, and evidence for, goal setting in rehabilitation. Goal setting is based on the belief that humans can change their behaviour and work towards a goal. Goal setting is important for rehabilitation because it can provide the patient with motivation. A meaningful goal can motivate a patient to participate in rehabilitation in order to achieve their goals. For example, the elderly patient in rehabilitation following a hip replacement who wants to return to living independently in their own home with their spouse. In order to do this, the patient needs to be independently mobile and therefore can see the importance of participating in physiotherapy. Goals can be thought of as hierarchical. 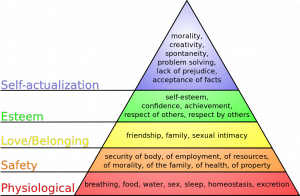 Maslow suggested that a person will make their physiological needs their primary goals. Once a person has met their physiological needs, he or she will make goals at the next level, safety and security, and so on. See Diagram One for all levels. Goal setting is also important as it keeps the focus of rehabilitation patient-centred. Goal setting helps health professionals plan their interventions for what is best or most meaningful for the patient instead of what suits the health professionals (where there are differences). Goals can be defined by time e.g. short, medium or long-term. In physiotherapy, goals are often activity based. For example, a patient being able to do a functional task independently or being able to walk a certain distance with the aid of walking frame. Goal setting is the process of discussing, planning and documenting outcomes for a patient or client. It can be as simple as a conversation between a physiotherapist / physical therapist and a patient during a treatment session. Or, in can be more complex and structured in a meeting between a multidisciplinary team and a patient. The patient’s social supports, e.g family members or friends, may also be invited to join in with goal setting if they have a role to play in helping the patient achieve a particular goal. Another system which is grounded in rehabilitation research is the Goal Attainment Scaling (GAS) by Turner-Stokes. GAS is “a mathematical technique for quantifying the achievement of goals”. GAS describes a process for setting goals and uses a five-point scale to measure if the goal is achieved or not. GAS scores can then be aggregated. Individual scores can be weighted to reflect either the relative importance of a goal to the patient or health professional or the difficulty in achieving the goal. There are some factors which can facilitate or create barriers to successful goal setting, see Table 1 below. Rosewilliam et al 2011 Stroke N/A Systematic review of 18 qualitative studies, eight quantitative studies and one mixed methods study N/A Nominal adoption of goals setting, discrepancies between perceptions and practice of goal setting, related ethical conflicts, strategies to improve goal setting, weak methodologies, some improvement in psychological outcomes, further research needed. Use a method such as SMART or GAS, and document the goals made with a date to review them and check for progress. ↑ Rosewilliam S, Roskell CA, Pandyan AD. A systematic review and synthesis of the quantitative and qualitative evidence behind patient-centred goal setting in stroke rehabilitation. Clin Rehabil. 2011. 25(6): 501-514. Available from http://journals.sagepub.com/doi/abs/10.1177/026921551039446725, Issue 6, pp. 501 - 514. Accessed 28 June 2018. ↑ 3.0 3.1 Bouwens SFM, van Heugten CM, Verhey FRJ. The practical use of goal attainment scaling for people with acquired brain injury who receive cognitive rehabilitation. Clin Rehabil 2009 23 (4):310 - 320. http://journals.sagepub.com/doi/abs/10.1177/0269215508101744 (accessed 17 July 2018). ↑ Scobbie L, Wyke S, Dixon D. Identifying and applying psychological theory to setting and achieving rehabilitation goals: development of a practice framework. Clin Rehabil 2009; 23 (4): 321-333. ISSN 0269-2155. https://strathprints.strath.ac.uk/20128/ (accessed 17 July 2018). ↑ Maslow AH. A Theory of Human Motivation. Originally published in Psychological Review 1943; 50, 370-396. Accessed from Green, CD. Classics in the History of Psychology [Internet] 2000https://psychclassics.yorku.ca/Maslow/motivation.htm (accessed 25 July 2018). ↑ 7.0 7.1 Turner-Stokes L. Goal attainment scaling (GAS) in rehabilitation: a practical guide. Clin Rehabil. 2009; 23 (4); 362-370. http://journals.sagepub.com/doi/abs/10.1177/0269215508101742 (accessed 26 July 2018). ↑ 8.0 8.1 Playford ED, Siegert R, Levack W, Freeman J. Areas of consensus and controversy about goal setting in rehabilitation: a conference report. Clin Rehabil. 2009. 23(4): 334-344.http://journals.sagepub.com/doi/abs/10.1177/0269215509103506. Accessed 27 June 2018. ↑ 9.0 9.1 Alanko T, Karhula M, Kröger T, Piirainen A, Nikander R. Rehabilitees perspective on goal setting in rehabilitation – a phenomenological approach. Disabil Rehabil. 2018. DOI: 10.1080/09638288.2018.1463398. Published online at https://www.tandfonline.com/doi/abs/10.1080/09638288.2018.1463398. ↑ 10.0 10.1 Plant SE, Tyson SF, Kirk S, Parsons J. What are the barriers and facilitators to goal-setting during rehabilitation for stroke and other acquired brain injuries? A systematic review and meta-synthesis. Clin Rehabil. 2016. 30(9): 921-930. Available from http://journals.sagepub.com/doi/pdf/10.1177/0269215516655856. Accessed 27 June 2018. ↑ Fischer S, Gauggel S, Trexler LE. Awareness of activity limitations, goal setting and rehabilitation outcome in patients with brain injuries, Brain Inj. 2004;18:6, 547-562. https://www.tandfonline.com/doi/abs/10.1080/02699050310001645793 (accessed 25 July 2018). ↑ Evans JJ. Goal setting during rehabilitation early and late after acquired brain injury. Curr Opin Neurol. 2012;25(6):651-5. https://www.ncbi.nlm.nih.gov/pubmed/23007008 (accessed 25 July 2018). ↑ Coffey L, Gallagher P, Desmond D. Goal Pursuit and Goal Adjustment as Predictors of Disability and Quality of Life Among Individuals With a Lower Limb Amputation: A Prospective Study. Arch Phys Med Rehabil. 2014; 95 (2): 244-252.https://www.sciencedirect.com/science/article/pii/S0003999313006230 (accessed 29 July 2018).